NEW FAVOURITE: THE LIZ JONES ALL-IN-ONE BRONZE FACE COMPACT. Make-up artists have a way of working extra magic with a face and making the most of its features. Nailing a golden sun-kissed make-up look that can take you from day to night is something I hadn’t managed to master yet because I could never seem to find the right shade of golden brown shadow, and most of my lip colours seem to take away the “natural” factor when added into the equation. A little while ago I met Australian make-up artist Liz Jones on a shoot and she introduced me to her range of make-up kits. 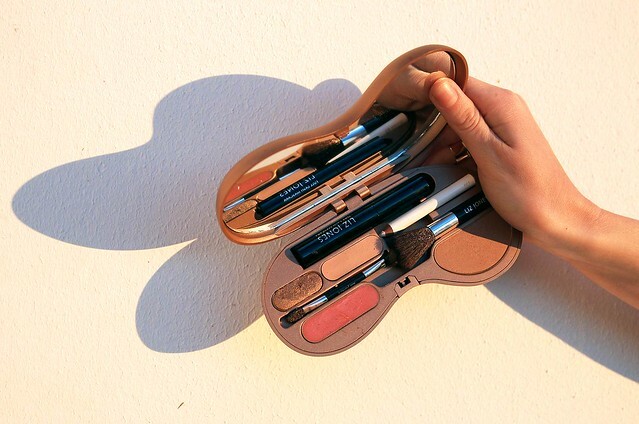 I’ve always been a little bit wary of kits because there are always some products in them that I don’t like or need, and never enough of the good stuff, but this bronze face compact has quickly become a favourite – particularly while travelling in Positano! The key is to keep it natural, using the concealer to touch-up blemishes, a bit of bronzer on the cheeks, copper bronze shadow to subtly contour the eye area and a white eye pencil to open-up the eyes and make them pop. Top it off with a few coats of mascara on the top lashes and a slick of the perfectly peachy and glossy, but not-too-glossy lip colour and you’re good to go! I love how all of the colours seem to compliment each other, and the white eye pencil is an essential little extra that makes a huge difference. Yep. You can thank me later. Wearing Liz Jones Bronze Face make-up kit, J Brand camisole and hat from Strand Hatters.